Obsolete: Scum-watch: Breathtaking chutzpah over an Afghan hijacker. 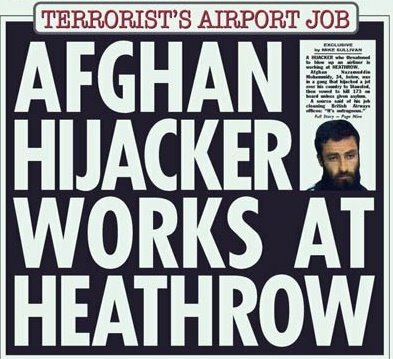 Scum-watch: Breathtaking chutzpah over an Afghan hijacker. 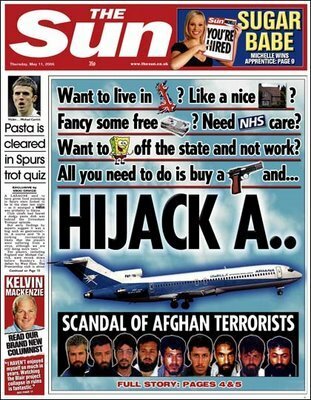 Two years ago, the Sun was outraged over the decision that the 10 Afghani men who felt their only way to escape the hell of life under the Taliban was to hijack a plane should be given leave to remain in this country. Their front page was one of the most mendacious of recent times, implying that the men who had escaped from a tyranny which the Sun supported the subsequent overthrow of were interested only in sponging off the state and having everything handed to them. It therefore takes an amazing amount of chutzpah for the Sun to today splash on one of the biggest non-stories it's ever put on its front page. Having previously smeared the men as wanting to not work when one of their main reasons for wanting to be given leave to remain was so that they could repay their debt, it now considers it a huge news story that, err, one of the men has a job. Or rather, that he works for a company which has a contract to clean a British Airways training centre, which means he has a pass to, in the Sun's parlance, "secure areas". If anyone can tell what the point of the Sun's anguish is, it would be nice to be informed. It can't seriously be suggesting that Nazamuddin Mohammidy is likely to repeat his previous offence, or that he's any sort of extremist when he escaped from the most fundamentalist Islamic government of modern times. No, this seems to be purely an exercise in trying to make the biggest possible mountain of the slightest molehill. The only reason the Sun knows about Mohammidy's current employment is because he was stopped by police on suspicion of being an unlicensed taxi driver, and when checking out he was who he said he was, discovered that he was in breach of bail after being accused of assaulting his landlord. While that suggests he's not necessarily an angel, if that wasn't already manifest, it also means that he's not housed by the state either, another of the Scum's smear tactics first time round. Rather than this being about Mohammidy, this seems to be more about asylum seekers and "human rights law" in general than any real concern about his working at Heathrow. That can be the only conclusion reached when the paper quotes "Sir" Andrew Green claiming that this proves the asylum system is being "abused", something which is not in the slightest bit proved by this case. We don't know the circumstances behind his alleged assault on his landlord, but it could quite easily have been a dispute which got out of hand. Apart from that, he's doing exactly what the government and Sun demands both asylum seekers and immigrants do: work and live off their own steam. The only abuse here is that the Sun seems to think it's in the public interest to hound those who somehow cross them or who might incredibly tenuously be linked to extremism. This was the case with its recent stalking of Abdul Maneem Patel, who was called "evil" and a "terrorist" after being released early from a six-month sentence for holding an explosives manual, found in a sealed box under his bed, for an older associate of his father. It can all be so different if you can conceivably be of commercial benefit to the Sun. I noted recently a surprisingly positive leader on Polish immigrants, which would never have appeared in any other of the tabloids. One of the reasons for the softening of their stance might just be because they're considering producing one-off Polish-language versions to coincide with Euro 2008, where Poland rather than England will be participating. Now just what would the gor blimey likes of Jon Gaunt think about that? Another good piece of Sum-watching. The Sun did actually produce a Polish version and I discovered it on a hidden part of their website. When they were confronted about it they said that it was only done for a staff competition. Make of that what you will. The hounds of love are calling.